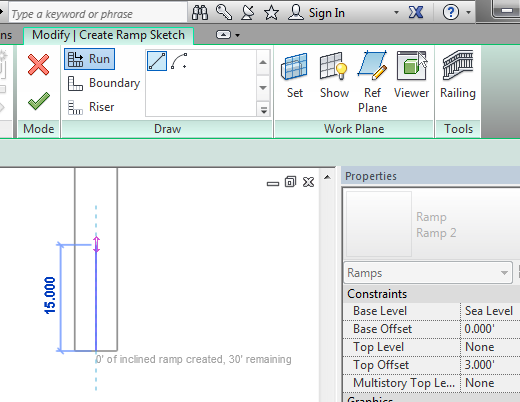 The Ramp tool is one of those archaic Revit tools that hasn’t been updated in a while (if ever). It is difficult to use and prone to errors. 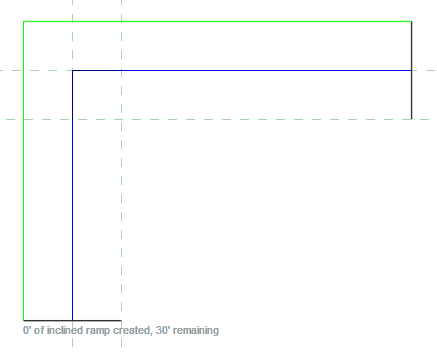 This discrepancy is obvious when comparing Ramps to Stairs. Since Stair by Component was introduced in Revit 2013, Stairs have been created from Run and Landing components, making them easier to manage and create. You can still create Stairs the old way (now called Stair by Sketch), but there is essentially no reason to use it since there is also a sketch tool in Stair by Component. To start off, the Ramp defaults to drawing the Run line and then automatically generating the Boundary and Riser lines (much like the old Stair). There is no way to adjust the Location Line, which makes it difficult to create a square landing. 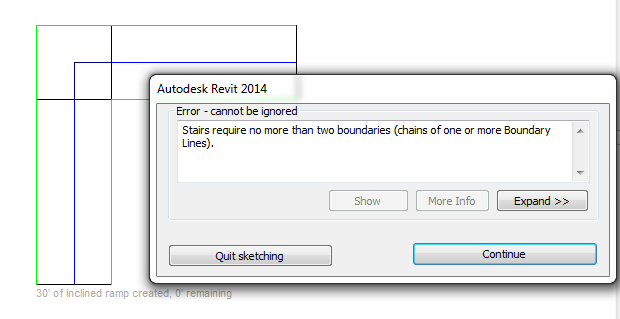 When you start off with a rectangular landing and and then adjust the lines to make it square, Revit will give you the error, “Stairs require no more than two boundaries” (even though there is clearly only two). After some testing, I was finally able to make a square landing, but only by deleting parts of the sketch and then re-drawing them. The error seems to occur because the two inner boundaries are not connecting (even though they appear to). To make them connect, you must first delete the two boundary lines and their adjacent riser lines. Then re-draw the boundary lines as a connect chain, and draw the riser lines again. 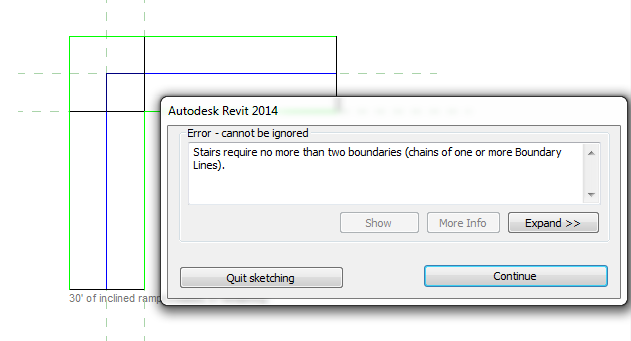 You can then finish the sketch without error. This seems entirely unnecessary and must be a glitch with how the Ramp generates its landings. Another difficulty of Ramps is that they are essentially worthless for creating Spot Elevations. 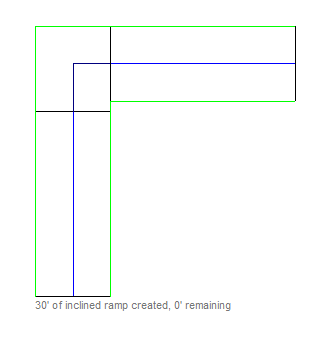 While the Spot Slope can be made to work on a Ramp with a slight workaround (it must be placed on a Floor first), the Spot Elevation tool does not work on Ramp runs at all. This is a deal-breaker and is reason enough not to use them, even without all of their other difficulties. 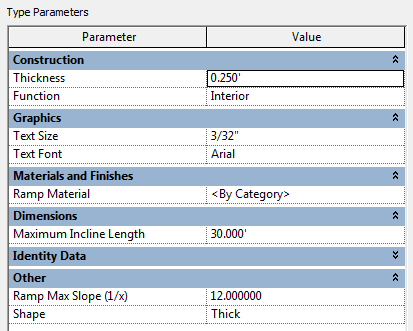 And finally, I dislike how the Ramp Max Slope and Shape parameters are stuck at the bottom, below all of the Identity Data. The Shape is at least a Construction parameter, is it not? 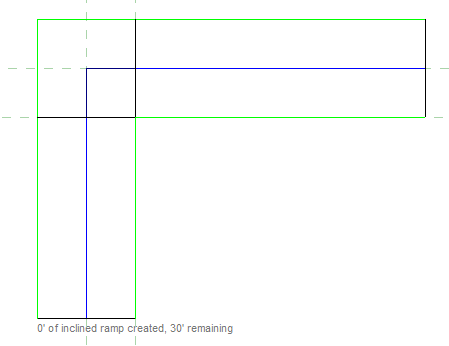 It would also be nice if the Ramp Max Slope units could match the project units, instead of always being 1/x. In the US, the standard in the landscape is frequently percentage slope. One of only reason I have heard for using Ramps is for the automatic Railing that follows the Ramp correctly. 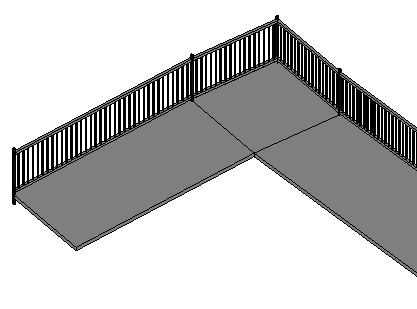 But since you can also do this with a Sloped Railing without a Host, I see very little reason to use Ramps at all.